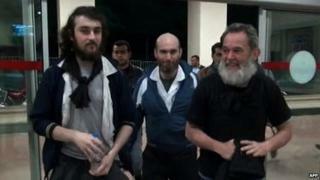 Four French journalists held captive in Syria for almost a year have been freed and are on their way home. French President Francois Hollande said he had "learned with great relief this morning of the liberation of the four French journalists". Edouard Elias, Didier Francois, Nicolas Henin and Pierre Torres were "in good health," he added. The four men had been held hostage in Syria since June 2013. Media captionDidier Francois: "It is very nice to see the sky"
Mr Francois said he was "very happy to be free" as the group spoke briefly to press at a police station in the Turkish town of Akcakale near the Syrian border. "We thank the Turkish authorities because they really helped us. And it's very nice to see the sky, to be able to walk, to be able to speak freely. I'm really happy," Mr Francois added. They were reported to have been found blindfolded with their hands bound by Turkish soldiers patrolling Sanliurfa province's border with Syria. The men left Turkey on board a French Air Force plane on Sunday evening, Turkey's Anadolu agency reported. The four went missing in two separate incidents in June. The jihadist group Islamic State of Iraq and the Levant (ISIS) were accused of kidnapping them. Mr Hollande said that he "shared the joy of the families of our compatriots who have endured the fear of this trying time". Mr Francois, a veteran war correspondent working for Europe 1 radio, and Mr Elias, a photographer, were abducted in early June on their way to Aleppo. Mr Henin, who was working for Le Point magazine, and Mr Torres, reporting for French-German television channel Arte, were taken later that month near Raqqa. Syria has become one of the most dangerous places for journalists. More than 60 have been killed in the country since the beginning of the uprising against President Bashar al-Assad three years ago.